Imaging software is a type of backup software that takes a snapshot of a drive with the ability to restore the image to the same drive or a new drive, should it be required. The drive’s image can be compressed to save space, though compression makes the imaging process take longer. While an image can be stored on the same drive that the image is made from, it’s safer to store it on a separate drive in case of catastrophic failure of the source drive. We are looking for foreign queries. Biowizard ver 4. 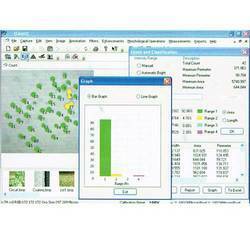 I is a new generation image analysis software meant for scientist to do analysis in the simplest way. This is a single screen window based system. The system is flexible, independent to adopt any capture card, camera and microscopes. Biowizard can handle monochrome (8 bits) and color (24 bits) images, multiple images of any size can be opened and displayed on the screen for analysis or comparison. The software support most common formats BME jpeg, tife png, gnd gif & psd. The full screen real time image can be observed and captured on the same platform. Since system is made in window environment, graphs and charts displayed on the monitor can be quickly transferred into other window-based program like ms word, ms excel or any other commercial window based software for the use in reports and presentation. Line measurements for distance, length, width, perimeter angle, three point radius. Area by enclosed line controlled by four arrow keys available on the keyboard arrow with zoomed preview. The line measurement is not effected on zoomed images. Identification of objects in an image, count them, obtain several features measurements. Objects identification by user or automatically. Manual, auto bright and auto dark methods to identify intensity range defined object to be measured. Various calculation & measurements ` y available for selected particle are; dimensions, area, perimeter, ferrite length, min/ max radius, thread length, thread width, fiber length, fiber width. Roundness, shape, orientation, elongation, equal circular diameter; equal sphere volume. Centroid x, centroid k ma]0rxl , maioryi , minor xl , minoryl , major x2, maiorf ma'or x2, minory2, box xl , x2, box y, y2 & box area. Measure area fraction & volume fraction. Three options: Direct print out with original image & tabular results. 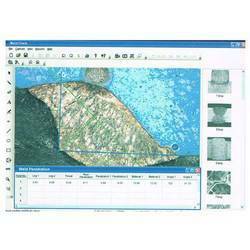 We provide Hardness pro Imaging software which can be used in where ever micro hardness testing machine are used. This package is also very useful in educational institutions and for all material science technocrats & metallurgists. Keeping in mind the needs of customers, we provide Cast Iron Software. 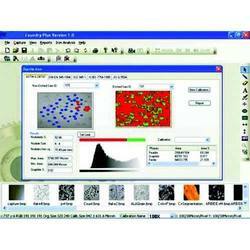 This software is totally automatic and provides complete analysis of micro structure of cast iron. The cast iron software that we offer is a result of untiring efforts of the team members who strive hard for innovation as well as client satisfaction. Offered software is developed with high precision & demanded in different industries. 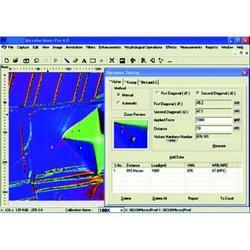 The software is totally automatic and provides complete analysis of micro structure of cast iron. The nodules form (designated by roman no. I to vi ) & size ( designated arabic no. I to 8 ) is reported. F% is reported in is method. This software Caliper Wiz is powerful for acquiring, organizing, storing, retrieving and editing any image . Lt handles different image formats BMP tife . Mg,`lme gie pcx, jpeg, plc. It support many cameras, frame grabbers and other usb-l , usb 2 & twain input devices. Cut, copy and paste, selected copy by free hand aol controlled by four with selected color at selected portion. Drawing tool curve, line, square and circle with node control and provision tool change color and thickness of the line. Write text in any color or font. Pointer to place on an obrect in four DN rections with provision to change its color and thickness. Eraser works only on lines, arrows or on any drawing tool. Not on original image, useful to merge different focuses of same. Line measurements for distance, length, width, perimeter angle three point radius. 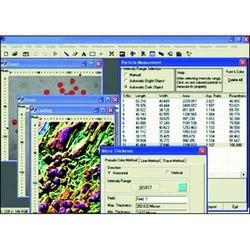 Imaging Software. The use of microscopic image analysis system is the most reliable technique v to characterize particle shape and to characterize a particle size and volume distribution. Tradition method, such as laser diffraction, although efficient, gives limited information on particle shape. The particle size, distribution and shape of-the particles can effect bulk properties, product stability and appearance of the end production pharma industry. The software is useful to measure and analyse the particle size, particle shape,particle count, foreign particle detection, particle structure, homogeneity, v surface coatings thickness. For spherical barticles (which are rarely encountered in pharmaceutical powders) the diameters are sufficient to describe the particle size. For non-spherical particles, feret`s diameter, particle orientation, particle i shape, elongation, convexity, circularity, circle equivalent diameter. This software is also useful to study the polarizing effects which study the cross section through pharmaceutical tablets by preparing thin-sections on slide with uv curing adhesive for final polishing. The cross section reveal the spatial distribution of components in the tablets so that any post compression change w (e. G. Polymorph conversions or change in the hydration state of components can be investigated. This new program with our polarizing microscope is very useful for quality control or Textile Pro Imaging Software testing laboratories for the analysis, micro-measurement of fiber yarn, threads,Material, non woven fabrics etc. 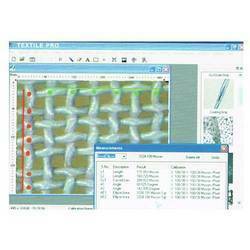 The real full screen display of image, acquisition, annotations, enhancement with hundred of filters, measurements, statistical processing of measured data are few of the capability of Textile Pro. Photographs of all Fibers view are pre loaded in the software to identify fibers without prior knowledge in the same. The library can be created & retrieved within the same programme. Analyse mechanical parts like needle points spinnerets etc. work flow and productivity are greatly improved. Weld check has been designed with your welding cross-section measurement needs in mind. Weld check's measurement module allows you to quickly measure items such as your fillet welds, throat, leg lengths and mi penetration. Use weld check measurement tolerance indicator to improve performance by having the software automatically tell you if a measurement is out of the the following report concerns the analysis of a fillet weld, a weld of approximately triangular cross section joining two surfaces at approximately right angles to each other important measurements made by the distance from the root if the fillet to the center of the face (or throat), the distance from the root of the joint to the junction between the exposed surface of the weld and the base metal (or leg), the angles and the root penetration. Measurements that could have been done with the same ease or similar sample are among others : depth of has (heat affected zone), area of has, joint penetration, phase counting etc. The measurement remain unaffected if the image is zoomed for better accuracy. The magnifier tool is also available which can be switched on any part of image. The tool zooms only the region surrounding the cursor allowing to increase the drawing precision while still seeing the whole sample. 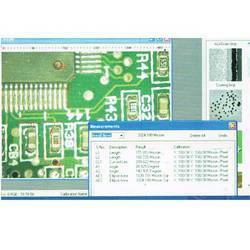 Image analysis system can measure a sequence specific characteristics or welded parts. The system brings the good tool with the good color when it's the time for the operator to use it.